Lou Tasler wanted to give her daughter, Sue Mc Farland, a gift to celebrate a recent successful surgery to remove a benign brain tumor. Doctors spotted Sue's quarter-sized tumor about six years ago. It didn't increase in size that first year, so they decided to keep an eye on it. But when the tumor recently increased slightly in size, Sue decided it was time to go ahead with surgery to remove it. Before the surgery, Lou had an idea for a way to commemorate the occasion. She and Sue were at an event called Empty Bowls, a fundraiser for a charity Lou holds close to her heart — Channel One Regional Food Bank. When Sue expressed admiration for a particular bowl, Lou decided to bid on it in hopes of giving it to her daughter. 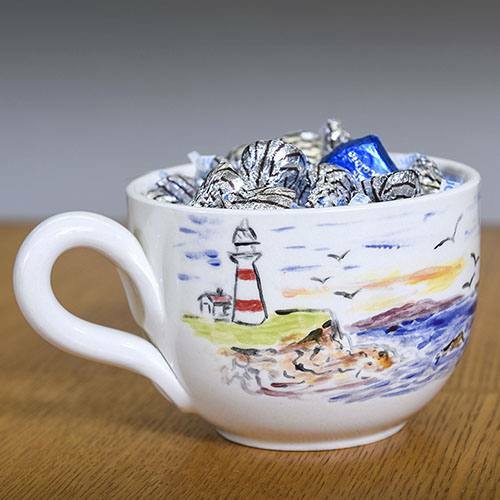 It was this particular artist's first attempt at painting a bowl, and he drew inspiration from the maritime region where he attended medical school in Nova Scotia. Clearly skilled in the art of bidding, Lou won, and hatched a plan to give the bowl to her daughter after the surgery. Then John Murphy, Public Affairs, heard about the purchase/gift and thought Sue should meet the artist. (Murphy is all about the flair.) So he set up a meet-and-greet. But he and Lou kept the plan a secret. Lou told Sue that she had a gift for her, and there were some folks at Mayo who wanted to write a story about it. Sue played along as Murphy led her and her mother to a conference room on Mayo 11 where "we can talk and take some photos." The character playing the role of reporter asked some stellar questions about Sue's surgery, recovery and care team, many of whom Sue knew from her 36 years working in Environmental Services at the Saint Marys Campus of Mayo Clinic Hospital — Rochester. "The care was great," she reported, noting that having people she knew and trusted taking care of her "was very comforting." Then the artist arrived with the gift. "Hi, Dr. Noseworthy," Sue said, more than a little surprised. 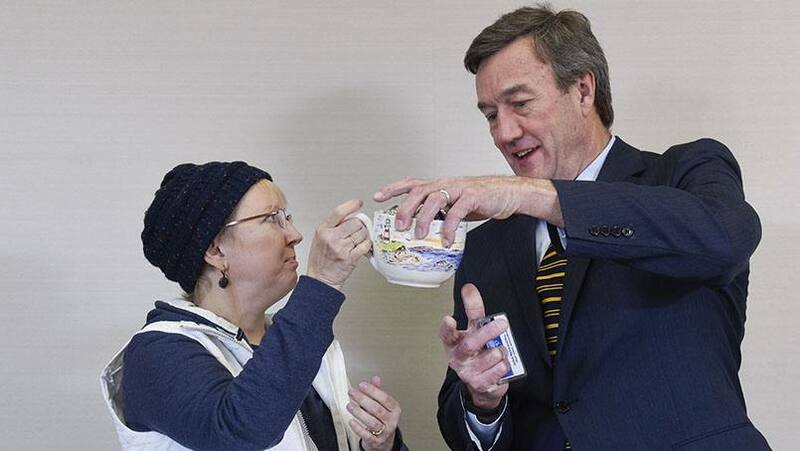 Dr. Noseworthy — also known as Mayo Clinic president and CEO John Noseworthy, M.D. — thanked Sue for her service to Mayo and then handed her a decorative box. She opened the box a little cautiously but recognized the piece right away. As Sue looked it over, Dr. Noseworthy said, "This is the first piece of art I've ever sold." Then he said to Lou, with a chuckle, that since it was for charity, "I hope you paid a lot for it." Lou, who had sweetened the deal by filling the bowl with chocolate candy, quietly noted that she had also sweetened the deal for Channel One by adding a donation on top of her purchase price. Before he left, Dr. Noseworthy asked Sue when she was "getting back to work," feigning disappointment that her return was still out a few weeks. The cameras missed that moment, but trust us, he can act as well as paint, along with that whole CEO-ing thing. Paint us a picture by sharing your comments below. You can share this story with others by using the social media tools atop this page.